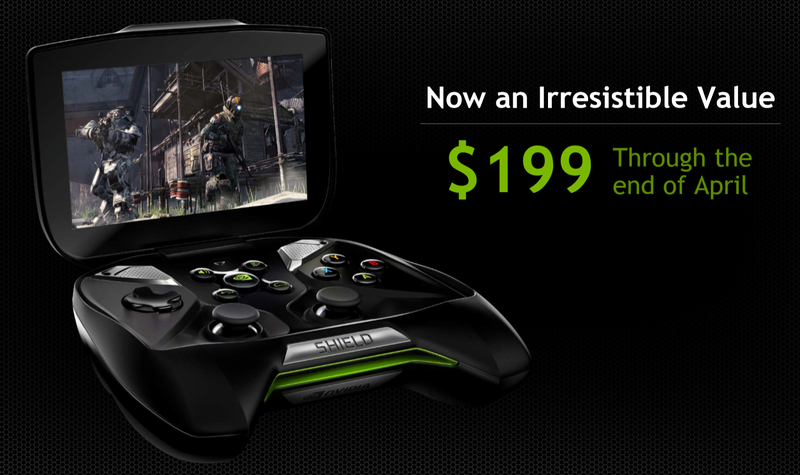 Has the prospect of KitKat and streaming PC games from anywhere not sold you on NVIDIA's SHIELD gaming machine? Not even the promise of Portal? Well aren't you hard to please. How about a price cut, bringing the final retail cost of the SHIELD down to $199? That's cheaper than the Nexus 7, and it puts the SHIELD in the same range as dedicated gaming portables like the PlayStation Vita and the Nintendo 3DS. There is one catch: the price is only going to stay this low through the end of April, after which it will revert to the standard $299. (Some retailers, including Amazon and Newegg, seem to have kept SHIELD at the $249 holiday price.) That still gives you five weeks to track one down, which should be more than enough. Considering that the SHIELD has a Tegra 4 processor, 2GB of RAM, excellent gaming controls, makes a great streaming device, and has full access to the Play Store, it's a downright steal. Retailers should be discounting their stock over then next few days - if you don't see the reduced price right away, give it a few hours. In our initial review of the SHIELD, Jeremiah Rice concluded that the device was a hard sell for Android gamers at $300. With the continued support that NVIDIA has provided, plus an expanded library of both Android games with SHIELD controls and streaming PC games, it's now become much easier to recommend. Compared to the 3DS or Vita, a $200 SHIELD has a lot more flexibility in terms of software. Compared to something like the OUYA or the Mojo, it's far and away a better experience. If you've ever wanted a SHIELD, now is the time to get one.